In the early days of quantum mechanics, the Heisenberg uncertainty principle was seen as something of a problem. It limits the ways in which it is possible to measure the state of things, and as such, imposes an in principle limit to how well we can manipulate and harness measurements for technological applications. More recently, however, there has been an outbreak of proposals that suggest Heisenberg uncertainty and other quantum mechanical principles can be harnessed for advanced applications in the information sciences. Of these, quantum key distribution (QKD) is the most advanced. This technique allows the sharing of a secret key between remote parties over an open communication channel. The crucial point is that if someone tries to eavesdrop on the transmission of this key, the communication channel is disrupted due to the uncertainty principle. Only a clean communication line will allow the sharing of a key and in this way, any key that is generated is guaranteed perfectly secure. 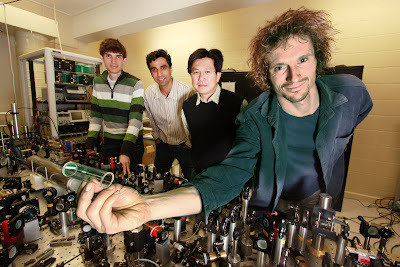 QKD has been demonstrated in optical fibres over distances over 60km . Unfortunately, beyond about 100km the losses in optical fibres, or indeed any transmission medium, mean that it becomes very slow or even impossible to share a key. One possible method to fix this problem is to build a quantum repeater . 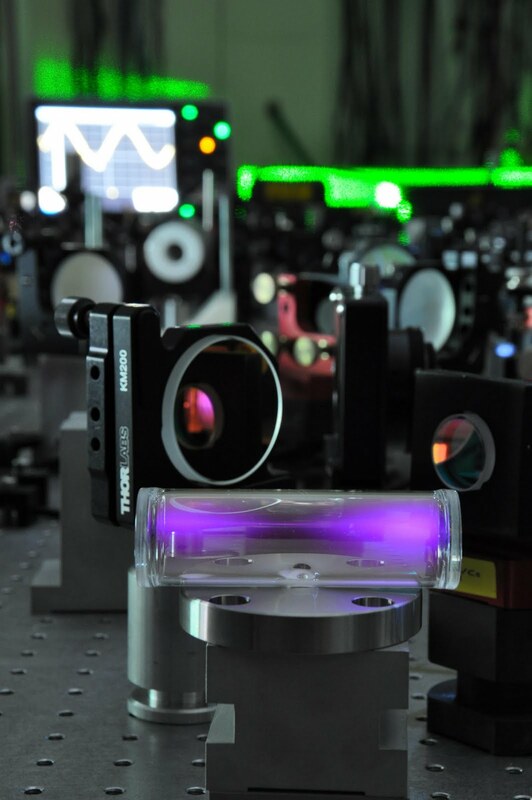 These devices, which are yet to be demonstrated, will extend the range of quantum communication beyond the current limit. Integral to proposed repeaters is some kind of memory capable of storing, and recalling on demand, quantum states of light . To build an ideal optical quantum memory, you need to capture a state of light with 100% efficiency without actually measuring it, since the quantum back-action from a measurement would disrupt the state. Then you have to recall it without adding noise or losing any of the light. Our approach to building a quantum memory relies on reversible absorption in an ensemble of atoms. This is a photon-echo technique known as a “gradient echo memory” (GEM). In this scheme we organise our ensemble such that the absorption frequency of atoms varies linearly along the length of our memory cell. This is done using an applied field, such as a magnetic gradient, to shift the resonant frequency of the atoms (see Fig. 1). 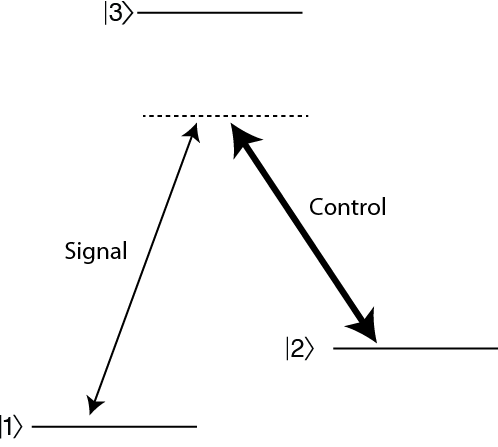 Figure 1: The GEM scheme. a: An pulse, in this example a modulated pulse, is incident on the memory cell, which has a gradient in the atomic absorption frequencies. b: The pulse is stored in the cell and due to the gradient, the atomic coherence has a spatial profile that is the Fourier transform of the pulse shape. c: After flipping the gradient, the pulse is recalled. The bandwidth of the applied broadening can be matched to the bandwidth of the incoming light pulse. After the light is absorbed into the ensemble, the atoms dephase at a rate proportional to the spread in absorption frequencies. All that is required to recall the light pulse is to reverse the gradient. This reverses the relative frequency detunings meaning that the atomic dephasing is time-reversed and the ensemble will rephase. When this happens, the light is recalled in the forward direction. This protocol works well in 2-level atoms, as described. Experiments with cryostatic rare-earth doped solid-state crystals have shown recall efficiencies up to 69% without added noise . This experiment was the first to beat the crucial 50% limit. Above this percentage, you can be sure that a hypothetical, all-powerful eavesdropper who, in principle, could have collected all of the missing light, will have less than 50% of the original information. This means that any eavesdropper has less information about the stored state than you do. In the absence of added noise, the 50% barrier corresponds to the “no-cloning limit”. 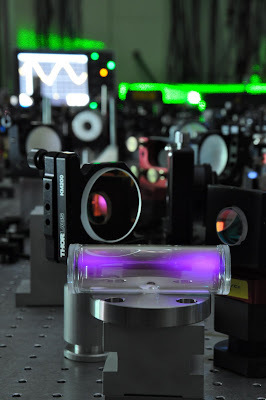 Our GEM experiments work in a 3-level atomic system in a warm gas cell. This has several advantages: i) there are many suitable 3-level systems; ii) gas cells are can be bought off the shelf and require a small heater rather than a large cryostat and iii) the simplicity of the setup means that we can rapidly try out new protocols. With three levels, the scheme is exactly as illustrated in Fig. 1, except that the upper and lower levels are now two hyperfine ground states, which are coupled using a strong “control” beam as shown in Fig. 2. The control beam brings new flexibility to our scheme. By switching the control field off, we can suppress recall from the memory. If we have multiple pulses stored in the memory then we can thus choose which ones to recall at which time – i.e. we have a random access memory for pulses of light . The Fourier nature of the memory also allows us to stretch and compress the bandwidth of the pulses, shift their frequency and recall different frequency components at different times . The efficiency of our system is also the highest ever demonstrated for a quantum memory prototype with up to 87% recall . We have also verified the “quantumness” of our memory by quantifying the added noise . We found, by using conditional variance and signal transfer measurements, that our system easily beat the no-cloning limit. In terms of fidelity, for small photon numbers, we found fidelities as high as 98%. Figure 3: One of our gas cells illuminated with 300mW of light at 795nm. The current system, using sauna-temperature gas cells (around 80 degrees C) is limited by atomic diffusion. The storage times are only a few microseconds. We plan to implement our scheme on a cold atomic ensemble in the near future to improve this aspect of our system. D Stucki, N Gisin, O Guinnard, G Ribordy, and H Zbinden, "Quantum key distribution over 67 km with a plug & play system", New Journal of Physics, 4, 41 (2002). Article. Nicolas Gisin and Rob Thew, "Quantum communications", Nature Photonics, 1, 165–171 (2007). Abstract. Alexander I. Lvovsky, Barry C. Sanders, and Wolfgang Tittel, Optical quantum memory, Nature Photonics, 3, 706–714 (2009). Abstract. Morgan P Hedges, Jevon J Longdell, Yongmin Li, and Matthew J Sellars, "Efficient quantum memory for light", Nature, 465, 1052–1056 (2010). Abstract. 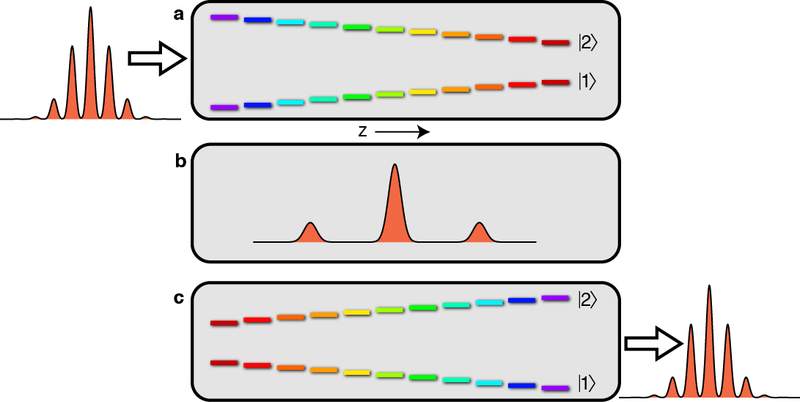 Mahdi Hosseini, Ben M Sparkes, Gabriel Hétet, Jevon J Longdell, Ping Koy Lam, and Ben C Buchler, "Coherent optical pulse sequencer for quantum applications", Nature 461, 241–245 (2009). Abstract. 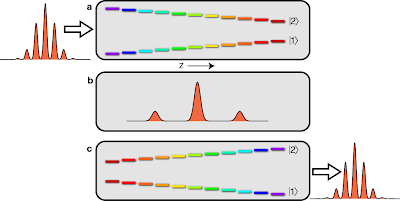 B. C. Buchler, M. Hosseini, G. Hétet, B. M. Sparkes and P. K. Lam, "Precision spectral manipulation of optical pulses using a coherent photon echo memory", Optics Letters, 35, 1091-1093 (2010). Abstract. M Hosseini, B M Sparkes, G Campbell, P K Lam, and B C Buchler, "High efficiency coherent optical memory with warm rubidium vapour", Nature communications, 2, 174 (2011). Abstract. M. Hosseini, G. Campbell, B. M. Sparkes, P. K. Lam, and B. C. Buchler, "Unconditional room-temperature quantum memory", Nature Physics, 7, 794–798 (2011). Abstract.